Nicole Miller-Struttman was quoted in the British newspaper The Independent this weekend about efforts to identify what is causing some bee populations to dwindle. The story was picked up by Yahoo! News and republished in several other publications around the world. 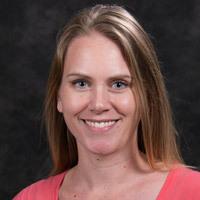 “In the long term, as these insects get fewer and farther between, the more and more expensive these foods we like to eat will be,” said Nicole Miller-Struttmann, an expert in ecology and population biology and an assistant professor at Webster University. Both Gauthereau and Miller-Struttmann say that there are things that individuals can do to help create environments where bees can thrive, however. Read the article at Yahoo UK here. Lindsey Kingston was interviewed on the BBC Newsday radio program on Jan. 2 about the cessation of refugee status for thousands of Rwandans. Many of the refugees now face situations of statelessness if they refuse to return "home" amid reports of ongoing human rights violations and political persecution of those who have been forced home, Kingston said. The story aired on BBC in the United Kingdom (starts around the 30:50 mark) as well as nationwide in the United States via National Public Radio affiliates. Her research on this subject was also recently published in Oxford University Press' International Journal of Refugee Law. 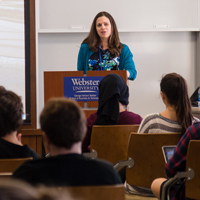 Kingston directs Webster’s Institute for Human Rights and Humanitarian Studies. She is an associate professor of international human rights in the Department of History, Politics, and International Relations, an academic department in Webster's College of Arts & Sciences. Remy Cross was interviewed by the Associated Press about a family's efforts to press charges against police in the “swatting” incident in Kansas last week. 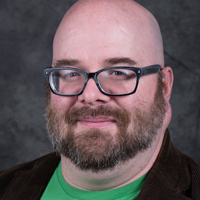 Cross is an assistant professor of sociology and criminology in the College of Arts & Sciences whose expertise includes criminology and policing. The story has appeared on more than 270 news sites, including numerous NBC affiliates across the country. Here is one version of the story at NBC's Dallas-Fort Worth affiliate. In the case, an online harasser called 911 and reported that a man was holding his family hostage, giving the address of the home of the person with whom he had an online argument. A SWAT Team responded and surrounded the house, ultimately fatally shooting the man, who was unarmed. Police have since arrested the "swatter" in the incident, while the family seeks additional charges against police. In the interview, Cross discussed the difficulty family's face in succeeding in such cases. Tom Palozola's brother started the Zola Initiative to fund more veterans centers on college campuses and increase services for veterans experiencing PTSD. 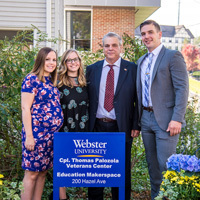 In October 2017, Webster University rededicated its Student Veterans Center for Tom Palozola, in memory of the alumnus who spearheaded its creation while he was a student and president of the Student Veterans Organization. Coverage of that commemoration and the Palozola family's Zola Initiative continues to grow. St. Louis Public Radio broadcast a feature story about Tom's legacy and his brother's efforts to fund more veterans centers and increase services for veterans with PTSD through the Zola Initiative. The story has been picked up and rebroadcast by several other National Public Radio (NPR) affiliates across the country, including this one in Boston.